I couldn’t install Telegram app in the version 3.4. 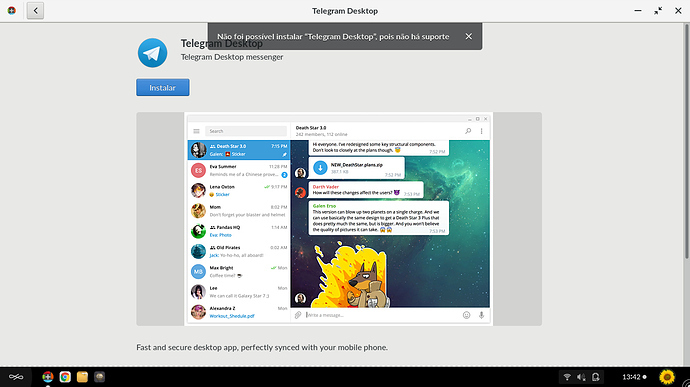 Appeared a error: “Isn’t possible install Telegram Desktop because don’t have support”. Telegram Desktop app should be installed correctly. @Beatriz_Calado I see that this report was on 3.4.0-beta1, and we’ve fixed some things related to app installs in the meantime, and I think there may have also been a recent fix of the Telegram build on Flathub. Can you please update to 3.4.0-beta3 and try again?